Un sac de qualité et très fonctionnel. je suis satisfaite de mon achat. Dommage que le rouge ne soit pas rouge comme celle livrée avec le sac mais rouge foncé ! Too bad the red is not red like the one delivered with the bag but dark red! Great strap. Keeps all of my rigs clipped to the wall for clean storage. These straps are great. Rig is more secure and will not fall of and will not swing around, I use 4 of them on my range bag and can only recommend it. Work like a charm. Holds my belt securely and out of the way. Based on customer feedback, we are pleased to now offer as an accessory, the Adjustable strap supplied with the RangePack Pro. This strap, which attaches to the front D-rings on the bag, is designed to hang your shooting Rig on the outside of your bag, for easy transport. A second strap is handy to prevent the rig from swinging from side to side. 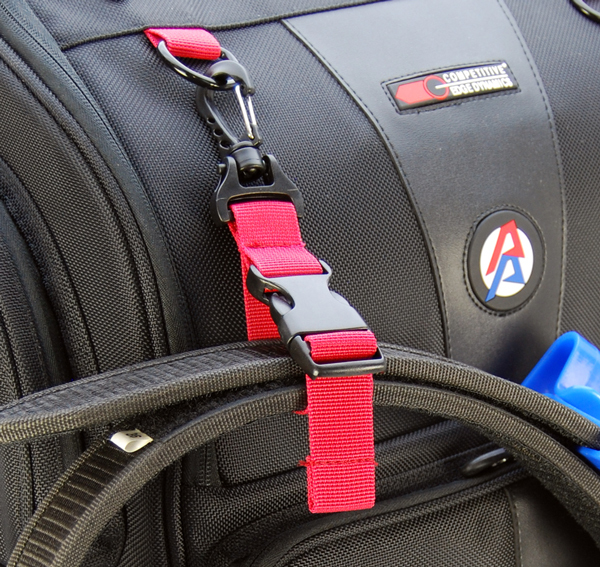 br> One such strap is included with your RangePack Pro. The item offered here is an additional strap only.